Last week I was down in Canterbury, attending a conference at the University of Kent entitled Gothic Feminism: The Representation of the Gothic Heroine in Cinema. It was a great conference, with some really interesting papers, and I thought it would be cool to pick up on some of the themes in Hannah’s Bookshelf on Saturday. Obviously, as it’s a literature show, I concentrated on representations of the Gothic heroine in literature, rather than cinema. If you missed the show, you can listen again on the player at the bottom of this post. As promised, here are the details of the books (and the heroines) I talked about. No run-down of my favourite Gothic heroines would be complete without an eighteenth-century classic. I selected Emily St Aubert, as Radcliffe’s 1794 novel was one of the first late eighteenth-century Gothics that I read. When her beloved father dies, Emily is left orphaned and in the care of her aunt, Madame Cheron. When aunt marries the sinister Count Montoni, the two plan to force Emily to marry a man named Morano – and threatening plans start to take shape. Will our heroine escape her fate? Will she be reunited with Valancourt, her handsome and benign suitor? Will she ever get out of the imposing Castle Udolpho? My next selection was some Victorian Gothic. Sheridan Le Fanu’s 1864 novel had me absolutely glued to the page when I first read it – and the locked room mystery at its heart was a big part of its charm, as I am a huge fan of locked rooms! Maud Ruthyn is the heroine here, an inquisitive girl who becomes fascinated by her father’s brother – the black sheep of the family – and the shadowy stories of scandal that surrounds him. When her father dies, Maud agrees to go and live at Bartram-Haugh with the mysterious Silas and his family… but will she survive to claim her inheritance? Of course my list of Gothic heroines has an Angela Carter book on it! I chose the 1984 Nights at the Circus – the story of Sophie Fevvers, a larger-than-life circus performer with a rather dramatic USP – for two reasons. Firstly, Fevvers is just such a memorable heroine that I felt she deserved to be on the list. And secondly, as with Uncle Silas, I just enjoyed reading the book so much. The book begins with journalist Jack Walser interviewing Fevvers about her life and career, plunging the reader into a fantastical (and perhaps unbelievable) world of magic, performance and other turn-of-the-century shenanigans. You might have been expecting to see Charlotte Brontë’s Jane Eyre on this list (but if you heard the show, then you’ll know why it’s not included). 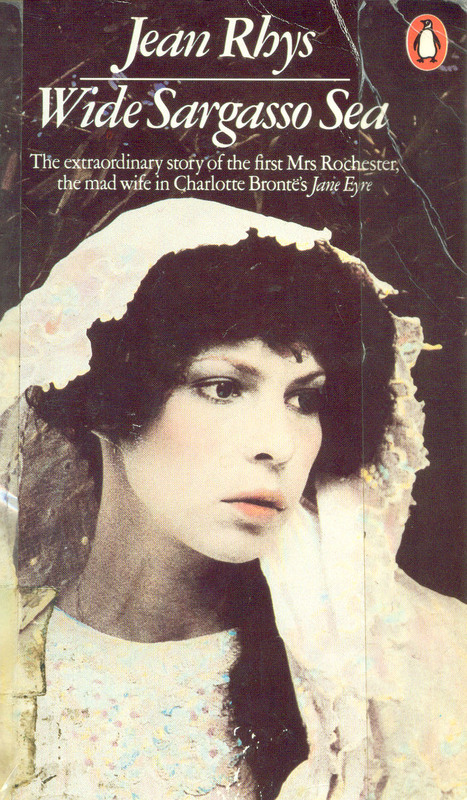 Rhys’s 1966 postcolonial novel (re)tells the story of a character who only makes a brief appearance in Brontë’s novel: Bertha Mason, the ‘madwoman in the attic’ and first wife of Mr Rochester. Reimagined as Antoinette Cosway (you’ll find out how she becomes ‘Bertha’ if you read the book), Rhys’s heroine is a fragile, tragic and passionate creation, and the author teases out the brutal and violent implications of a story only lightly alluded to in Brontë’s work. I first read Wide Sargasso Sea in 1995, and it remains one of my favourite books of all time. So this is a very strong recommendation! Time for a twenty-first century heroine, and one of my favourite YA novels. I fell in love with Melissa Marr’s Wicked Lovely when I first read it, but I’ve chosen the 2008 sequel for this list, as there’s something truly fascinating about its heroine, Leslie. Marr’s series is about fairies, and the second book focuses on the Dark Court. When human teen Leslie decides to get a tattoo (an act intended to help her recover from a horrific trauma), she inadvertantly selects a design that will leave her tethered to Irial, the king of the Dark Court. Will she be able to escape the fairy’s ink? Or is she destined to remain tied to him forever? Ink Exchange is a very stylish book, with a strange mixture of nastiness and hope that makes for a very compelling read. And finally… the heroine (if you can really call her a heroine) that I spent a big chunk of my early teens wishing I could be. Titus Groan (and its sequel Gormenghast) is undoubtedly in my top ten books of all time, and this is partly because of the sullen, awkward, romantic and naive Fuchsia Groan. Peake’s 1946 novel is quite hard to describe, and is quite an unusual experience to read, but the term ‘fantasy of manners’ has become attached to it. Telling the story (or, more often, setting the scene) of the vast, crumbling edifice that is Gormenghast, the novel introduces us to the family of Sepulchrave, seventy-sixth Earl of Groan, and the rituals, traditions and ceremonies that govern their existence. Fuchsia is the earl’s fifteen-year-old daughter, who is ignored by her parents and annoyed by the birth of her new brother, Titus. Left alone for so much of the time, Fuchsia retreats to her rooms in the attic to daydream and scrawl wild pictures on the wall in charcoal. What’s not to love about that?